Anne Hathaway is indeed headed for Sesame Street. A couple of months ago the actress was rumored for a possible Sesame Street movie over at Warner Bros. Not only is Hathaway now officially on board, but we're getting some project details from the film's director, Portlandia's Jonathan Krisel. Speaking with THR, Krisel confirmed Hathaway's involvement, and described the film as a musical which draws inspiration from words in the unforgettable theme song, "Can you tell me how to get, how to get to Sesame Street?" The story finds the Sesame Street characters lost in New York City with no clue how to get back home. 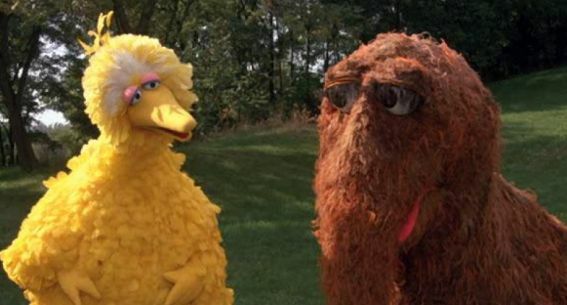 Maybe they should talk to Big Bird who went on a cross-country trek way back in 1985's Follow that Bird? Surely he knows how to catch a taxi or call an Uber? "Sesame Street never sold out. Yes, it's on diapers and it's a brand, but it never got cheesy. For 50 years, it has never lost its sheen. That's why it's daunting. You don't want to be the guy who does that to Sesame Street." With Hathaway on board filming could begin by late summer, and don't expect for her to be the only celebrity appearance if Follow that Bird is any example.